In the last twenty years, the Brazilian government has created a number of income transfer programs for the poorest portion of the population to promote food and nutrition security and eradicate extreme poverty, hunger and malnutrition. These programs have achieved satisfactory results, which cannot, however, be attributed solely to the transference of income, as they involve other governmental public policies in health, education and basic sanitation. Combined, the aim of such public policies is to break patterns of the poverty across generations, thereby contributing to human development in the country. En las últimas dos décadas, el gobierno brasileño creó varios programas de transferencia de ingresos para los más pobres con el objetivo de promover la seguridad alimentaria y nutricional, así como para erradicar la pobreza extrema y el hambre. Estos programas proporcionaron algunos resultados satisfactorios, lo que no se puede atribuir exclusivamente a la transferencia de ingresos, sino también a otros sectores gubernamentales y a diversas políticas públicas en las áreas de educación, salud y saneamiento básico. En conjunto, estas políticas están destinadas a romper el patrón de pobreza intergeneracional, contribuyendo con el desarrollo humano del país. Public health, nutrition and income redistribution policies have returned to the political agenda in Brazil in the last twenty years in an attempt to improve quality of life among the population. The following is an overview of recent public policies regarding food, nutrition and income redistribution in the country and how these policies can contribute toward human development. This paper highlights the main programs and outcomes as well as studies addressing nutrition issues. The study of the specifics of the Brazilian situation in relation to food and nutrition programs is relevant when one considers the advances achieved over the last twenty years in terms of governmental proposals. In the past, attempts at reducing nutritional problems were traditionally addressed through welfare practices. With the current creation of more efficient policies and programs, malnutrition and vitamin A deficiency have decreased considerably, which has led to a change in the nutritional profile of the population (1-4). Income distribution is also a determinant of the health and nutritional status of a population as well as the capability of reaching its potential in terms of human development (5-7). In the 1940s, the Brazilian government instituted the minimum wage in an attempt to reduce existing social tensions. However, it was only through the creation of the National Institute of Food and Nutrition in the 1970s that it was possible to come up with more structured programs focused on the main nutritional problems in the country. Such programs failed due to a lack of political commitment, interrupted funding, embezzlement, the overlapping of programs and delays in the distribution of food items, leading to the dissolution of the institute in 1997 (8,9). Finally, in 1999, a National Food and Nutrition Policy was included as an integral part of the Brazilian National Health Policy and has since contributed to the universal human right to adequate food and nutrition, thereby ensuring nutrition security (1, 8, 10). In 2001, Brazil adopted an initiative similar to other countries as a strategy for reducing nutritional deficits and infant mortality: cash transfer programs for the poorest portions of the population. The Food Grant Program consisted basically of distributing cash benefits to the poorest families based on health-related conditions (5, 11, 12). Upon its cancellation in September 2003, the program was assisting 2.3 million beneficiaries, with transfer expenses of approximately US$ 103 million. Evaluations regarding the impact of the program indicated that the families benefitted indeed experienced quantitative and qualitative improvements in their diets, with an increase in the amount of money spent on fruit, green vegetables and meat. The children of these families exhibited signs of nutritional recovery and accelerated growth (12). In 2003, the Family Grant Program unified the four cash transfer programs of the federal government: the Food Grant Program, School Grant Program, Natural Gas Stamp and Food Card. The Family Grant Program is currently the largest example of a cash transfer program in the world (13), the aim of which is to reduce poverty and social inequality through the direct transfer of cash. Table 1 shows the evolution of the Family Grant Program with respect to amounts spent since its inception in 2003 through to 2011. The program is restricted to ‘poor’ and ‘extremely poor’ families with monthly incomes below R$70 (US$ 37.04; US$ 1.00 = R$ 1.89) (14). The exact transfer amount depends on income levels and the composition of the household. Benefitted families must commit to maintaining their children and teenagers in school and carry out basic healthcare actions (15, 16). 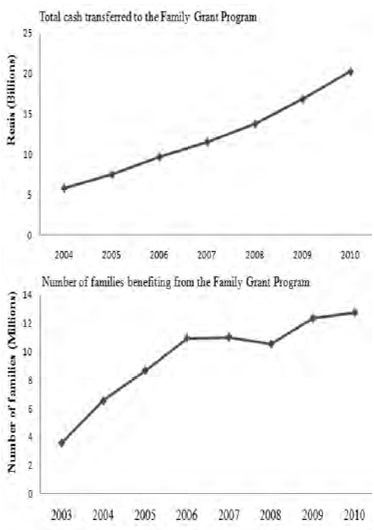 Figure 1 shows the evolution of the number of families benefiting from the Family Grant Program since its creation through to 2010. In less than a decade of existence, the program nearly quadrupled the number of beneficiaries, increasing from 3.6 million beneficiaries in 2003 to about 12.8 million in 2010 (approximately 25% of the Brazilian population). With respect to amounts invested in the payment of benefits, the program paid out R$ 5.9 billion (US$ 3.1 billion) in 2004 and this figure rose to about R$ 20.3 billion (US$ 10.7 billion) in 2010 (17). Despite the expansion in the number of families served, it is noteworthy that the cost of the Family Grant Program corresponds about 0.4% of gross domestic product of Brazil, which is nearly thirty-fold lower than the social security budget. This indicates that, although the program has had a positive impact on reducing poverty and inequality in Brazil, it still has a relatively small budget in the country (18). In the field of nutrition, the National Survey on Demographics and Children’s and Women’s Health funded by the Brazilian Ministry of Health reveals that the Family Grant Program has contributed to a reduction the weight-for-age deficit among beneficiary children (19). Moreover, the program is reported to have contributed to a reduction the height-for-age deficit among beneficiary children between 2005 and 2009 (20). A nutritional evaluation study conducted in the semi-arid region of northeastern Brazil (one of the poorest areas in the country) offers another example of how social inequalities are being reduced. Nineteen thousand children under five years of age were evaluated and a decline in malnutrition was observed from 47.8% in 1974/1975 to 6.6% in 2005. The Family Grant Program has reduced the occurrence of height/age deficit in children by 30%. Appropriate targeting was verified in 75% of the families classified at the lowest socioeconomic levels. Moreover, improvements in prenatal care, basic sanitation and mothers’ educational level have also contributed toward a better nutritional status in this population as well as reductions in the fecundity index and the prevalence of low birth weight (21). A study employing data from national immunization campaigns to estimate the prevalence of anthropometric deficits among 22.4 million children under five years of age found that those covered by the Family Grant Program were 26% more likely to be within the normal height and weight range for age than those who did not participate in the program (22). The Family Grant Program integrates a larger project in the current administration’s strategy: the Zero Hunger Program, which is aimed at ensuring the human right to adequate food, promoting adequate nutrition and contributing to the eradication of extreme poverty and the conquest of civil rights among the most vulnerable portion of the population (23). Actions associated with this program have brought the hunger problem back to the political agenda in Brazil, causing repercussions throughout the world and reinforcing the importance of the mobilization of society (1, 23). While the duty of eradicating hunger lies heavily on the shoulders of the State, society should become mobilized either by participating in the formulation and control of public policies or through volunteer actions (1). Access to adequate amounts of safe, nutritious and culturally appropriate food at all times is a fundamental human right (1, 24). Therefore, systematic, sustained action is needed to bring an end to domestic food insecurity and hunger and to achieve food and nutrition security for all (11). Food insecurity can lead to various negative outcomes, including poor dietary intake, inadequate nutritional status, poor health, increased risk of developing chronic diseases, poor psychological and cognitive functioning and sub-standard academic achievement (25, 26). The Brazilian Scale of Food Insecurity was adapted from the scale drafted by the US Department of Agriculture and classifies homes into one of four categories: food security and mild, moderate or severe food insecurity (27, 28). Data from the National Household Survey conducted in 2004 and published in 2006 included a module on Food Insecurity for the first time (29) and a new module was included in the 2009 survey (30). According to the data, 65.0% of private households had food security in 2004 and this figure had risen to 69.8% by 2009 (29, 30). The remaining private households in 2004 (34.9%) and 2009 (30.2%) had some degree of food insecurity or some concern with the possibility of restrictions due to a lack of resources. Among the households assessed in 2004, about 7.0% were classified as having severe food insecurity. This percentage had dropped to 5.0% by 2009 (30) (Table 2). The five mega-regions of Brazil have prevalence rates of households in situations of food insecurity of different magnitudes. While 40.3% and 46.1% of households in the northern and northeastern regions were respectively classified as having food insecurity, these proportions were below ¼ of households in the southeastern (23.3%) and southern (18.7%) regions in 2009. Thus, regional inequality continues to plague the country, as 9.2% and 9.3% of households in the northern and northeastern regions were classified as having severe food insecurity in 2009, whereas this figure was less than 3.0% in the southern and southeastern regions (30). The 2004 module associated the food security with cash transfer programs. It was found that, among the eight million homes in which some resident received money from the government, 52.1% lived in the northeastern region of the country. Among the homes in which there was at least one beneficiary of the government social program, 34% experienced food security and 25%, 26% and 15% experienced mild, moderate and severe food insecurity, respectively (29). An analysis of food and nutrition programs in Brazil reveals that important changes have occurred, especially since the mid 1980s. The current situation reflects a more mature way of fighting hunger and the most relevant nutritional problems that derive from hunger (31). The expected outcomes of these programs depend on adequate management. However, the evaluation of the results, processes and impacts achieved may be limited (32). Cash transfer programs in Brazil have achieved satisfactory results, which, however, cannot be attributed solely to the transfer of income, as they involve other governmental public policies in health, education and basic sanitation. Combined, the aim of such public policies is to break patterns of the poverty across generations, thereby contributing to human development in the country. The many changes, setbacks and advances observed are an integral part of the country’s history and also reflect in the way these programs are planned and managed. The lessons learned over the years, with a change in focus from mere emergency and compensatory actions to emancipatory strategies, should lead the population to the concrete possibility of exercising its civil rights. In order to ensure the continuity and improvement of such policies, the State, in a partnership with civil society, must develop actions promoting the human right to adequate food, which should not dissociated from human rights, thereby ensuring dignity and quality of life for all inhabitants. Valente, FLS, Beghin, N. Realization of the Human Right to Adequate Food and the Brazilian Experience: Inputs for Replicability. ABRANDH – Ação Brasileira pela Nutrição e Direitos Humanos. Support FAO. Brasília, [Serial on the Internet] September, 2006. [Cited 2011 July 7]. Available at: http://www.fao.org/righttofood/kc/downloads/vl/docs/DOC_ING_final.pdf. Monteiro CA, Conde WL, Popkin BM. The burden of disease from undernutrition and overnutrition in countries undergoing rapid nutrition transition: a view from Brazil. Am J Public Health. 2004; 94(3): 433-34. Doak CM, Adair LS, Bentley M, Monteiro C, Popkin BM. The dual burden household and nutrition transition paradox. Int J Obes. 2005; 29(1): 129–36. Barros AJD, Victora CG, Cesar JA, Neumann NA, Bertoli AD. Brazil: Are health and nutrition programs reaching the neediest? HNP Discussion Paper. Reaching the Poor Program Paper N°9 [Serial on the Internet] April 2005. [Cited 2011 July 7]. Available at:http://siteresources.worldbank.org/HEALTHNUTRITIONANDPOPULATION/Resources/281627-1095698140167/BarrosBrazilFinal.pdf. Ferreira FHG, Leite PG, Litchfield JA. The Rise and Fall of Brazilian Inequality: 1981-2004. Report N° WPS3867, Word Bank, Washington, DC, [Serial on the Internet] March 2006. [Cited 2011 July 7]. Available at: http://go.worldbank.org/SMUSVZGZE0. World Bank. Brazil, Measuring Poverty using Household Consumption. Poverty Reduction and Economic management Sector Unit, Latin American and the Caribbean Region. Report N° 36358-BR, Word Bank, Washington, DC, [Serial on the Internet] 2007. [Cited 2011 July 7]. Available at: http://go.worldbank.org/HC7C2UESM0..
Valente FLS, Immink MDC, Coitinho DC. How political and social activism lead to a human rights approach to food and nutrition security in Brazil. Ecol Food Nutr. 2001; 40(6): 619-33. Schmitz BAS, Heyde MEDV, Cintra IP, Franceschini S, Taddei JAC, Sigulem D. Governmental Food and Nutrition Policies and Programs in Brazil and their involution. (Políticas e Programas Governamentais de Alimentação e Nutrição no Brasil e sua Involução). Cad Nutr. 1997; 13: 39-54. Brazil. Ministry of Health. National Food and Nutrition Policy (Política Nacional de Alimentação e Nutrição). Série B. Textos Básicos de Saúde. 2ª edição revista, Brasília, Distrito Federal [Serial on the Internet] 2003. [Cited 2011 July 7]. Available at: http://189.28.128.100/nutricao/docs/geral/pnan_en-glish.pdf. Maluf RS. Economic development and the food question in Latin America. Food Policy. 1998; 23(2): 155–72. Brazil. Ministry of Health. Feeding Grant Program’s Evaluation (Avaliação do Programa Bolsa-Alimentação). Segunda Fase. Série C. Projetos, Programas e Relatórios. Brasília, Distrito Federal, [Serial on the Internet] 2005. [Cited 2011 July 7]. Available at: http://dtr2001.saude.gov.br/editora/produtos/livros/popup/05_0145.html. Paes-Sousa R, Santos LMP, Miazaki ES. Effects of a conditional cash transfer programme on child nutrition in Brazil. Bull World Health Organ, [Serial on the Internet] 2011, 89 (7), 469-544. [Cited 2011 July 6]. Available at: http://www.who.int/bulletin/volumes/89/7/10-084202/en/index.html. World Bank. Brazil - Second Family Grant. Report N° AB2729. Latin American and Caribbean Region. Washington, DC, [Serial on the Internet] 2006. [Cited 2011 July 7]. Available at: http://go.worldbank.org/MWX7PAGNF0. World Bank. Brazil - Second Family Grant. Report Number: AB2729. Latin American and Caribbean Region. Washington, DC, [Serial on the Internet] 2009. [Cited 2011 January 20]. Available at: http://wwww.ds.worldbank.org/external/default/WDSContentServer/WDSP/IB/2009/06/22/000104615_20090623124240/Rendered/PDF/BR1BFP020PID1Concept0Stage006118109.pdf. Soares S, Sátyro N. Family Grant Program: Institutional Design and Future Possibilities (O Programa Bolsa Família: Desenho Institucional e Possibilidades Futuras). In: De Castro JÁ, Modesto L. Family Grant Program 2003-2010: Progress and Challenges (Bolsa Família 2003-2010: Avanços e Desafios). Brasília: Ipea, 2010; 1: 1-344. Brazil. Ministry of Health. National Survey on Demography and Health of Women and Children – PNDS 2006 : dimensions of reproduction and child health (Pesquisa Nacional de Demografia e Saúde da Criança e da Mulher – PNDS 2006 : dimensões do processo reprodutivo e da saúde da criança). Ministry of Health, the Brazilian Center for Analysis and Planning. - Brasília: Ministry of Health. 2009; 1-300. Curralero CB, et al. The Conditionality of the Family Grant Program (As Condicionalidades do Programa Bolsa Família). In: De Castro JÁ, Modesto L. Family Grant Program 2003-2010: Progress and Challenges (Bolsa Família 2003-2010: Avanços e Desafios). Brasília: Ipea, 2010; 1: 1-344. Brazil. Ministry of Social Development and Hunger Combat. Nutritional Call: A study about the nutritional situation of children in Brazil’s semi-arid region (Chamada Nutricional: Um estudo sobre a situação nutricional das crianças do Semi-árido brasileiro). Cad Est Desenv Soc Debate. 2006; 4:1-116. Presidência da Republica Federativa do Brasil. Fome Zero. [Serial on the Internet]. [Cited 2011 February 24]. Available at: http://www.fomezero.gov.br/. Struble MB, Aomari LL. Position of the American Dietetic Association: Addressing world hunger, malnutrition, and food insecurity. J Am Diet Assoc. 2003; 103(8): 1046-57. American Dietetic Association. Position of the American Dietetic Association: Food Insecurity and Hunger in the United States. J Am Diet Assoc. 2006; 106: 446-58. Jyoti DF, Frongillo EA, Jones SJ. Food insecurity affects school children’s academic performance, weight gain, and social skills. J Nutr. 2005; 135(12): 2831-39. Pérez-Escamilla R, Segall-Corrêa AM, Maranha LK, Sampaio MFA, Marín-León L, Panigassi G. An Adapted Version of the U.S. Department of Agriculture Food Insecurity Module Is a Valid Tool for Assessing Household Food Insecurity in Campinas, Brazil. J Nutr. 2004; 134(8): 1923-28. Carlson SJ, Andrews MS, Bickel GW. Measuring food insecurity and hunger in the United States: development of a national benchmark measure and prevalence estimates. J Nutr. 1999; 129: 510S-16S. Ministry of Planning, Budget and Administration. Brazilian Institute of Geography and Statistics. National Household Sample Research (Pesquisa Nacional por Amostra de Domicílios), [Serial on the Internet] 2004. [Cited 2011 July 7]. Available at: http://www.ibge.gov.br/home/estatistica/populacao/trabalhoerendimento/pnad2004/default.shtm. Brazil. Ministry of Planning, Budget and Management. National Survey by Household Sampling - Food Safety 2004/2009 (Pesquisa Nacional por Amostra de Domicílios - Segurança Alimentar 2004/2009). IBGE. Rio de Janeiro, 2010; 1-183. Vasconcelos, F de AG. Fighting hunger in Brazil: a historical analysis from Presidents Vargas to Lula. Rev Nutr. 2005; 18(4): 439-457. Galván M, Amigo H. Programas destinados a disminuir la desnutrición crónica. Una revisión en América Latina. Arch Latinoam Nutr. 2007; 57(4): 316-326.